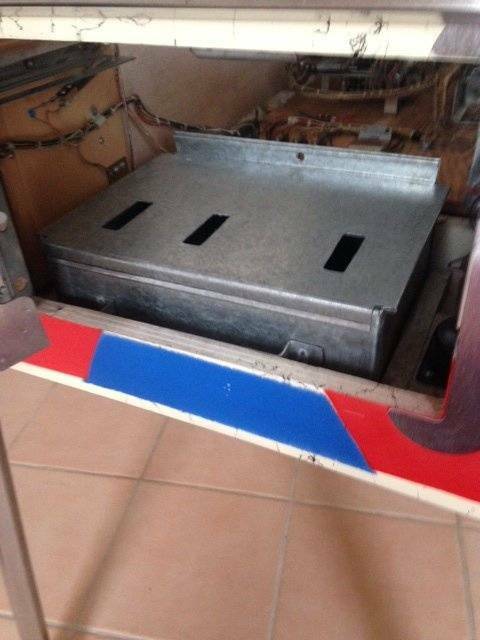 » Forum » Electro-Mechanical » EM Arcade Games » Can someone help me find this Coin Box? 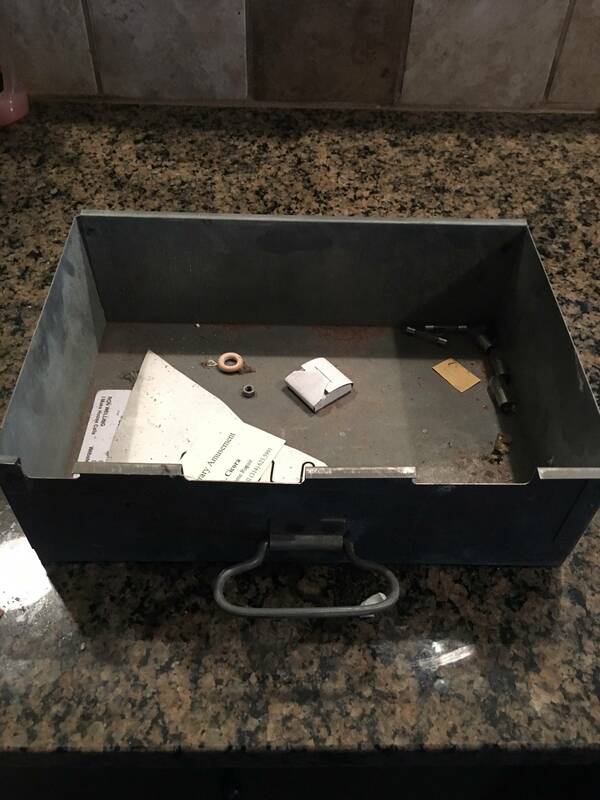 » Can someone help me find this Coin Box? 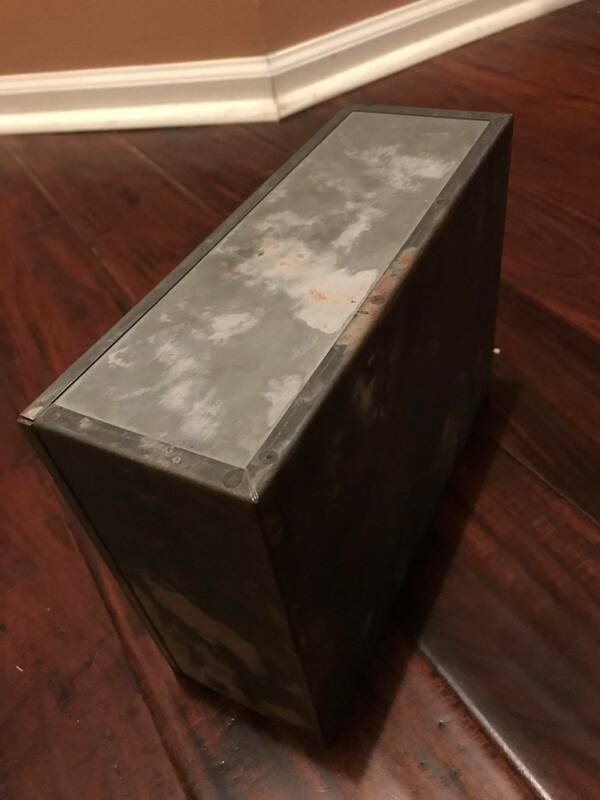 Can someone help me find this Coin Box? I’m in need of the below coin box. It’s from a Bally Skill Roll, but I’m assuming the boxes would be the same in any Bally game of that age. 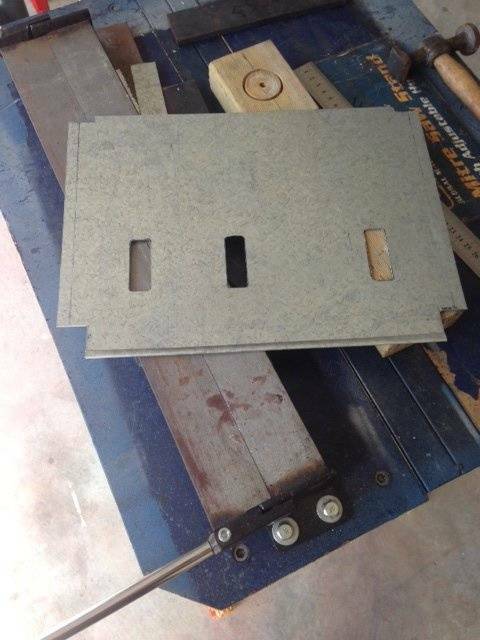 It measures a little shy of 9 3/4” wide by 7 1/4” deep by 3 1/2” high. If some has this, please shoot me a pm. If you cannot locate one fabrication is not out of the question. It is not a difficult profile and can be achieved with minimal tools. I found a small brownie pan that fit well. 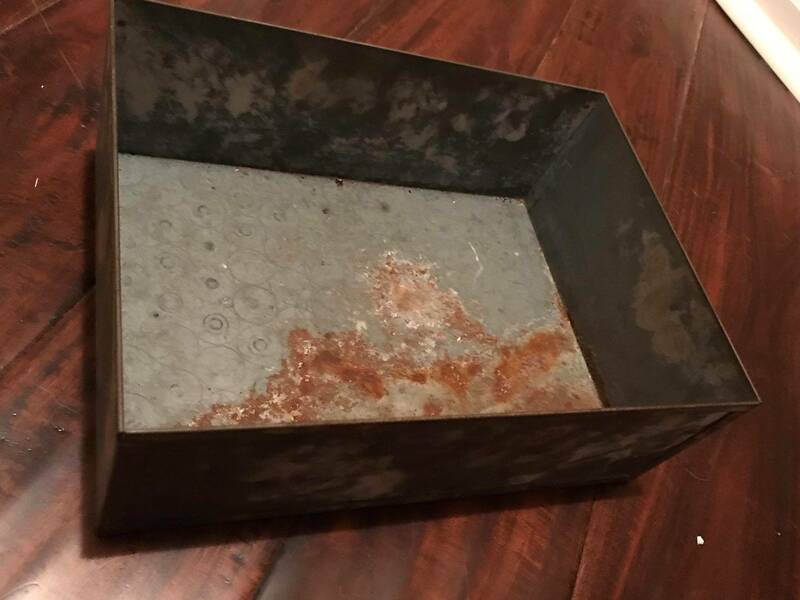 You've got me!-whats a brownie pan? 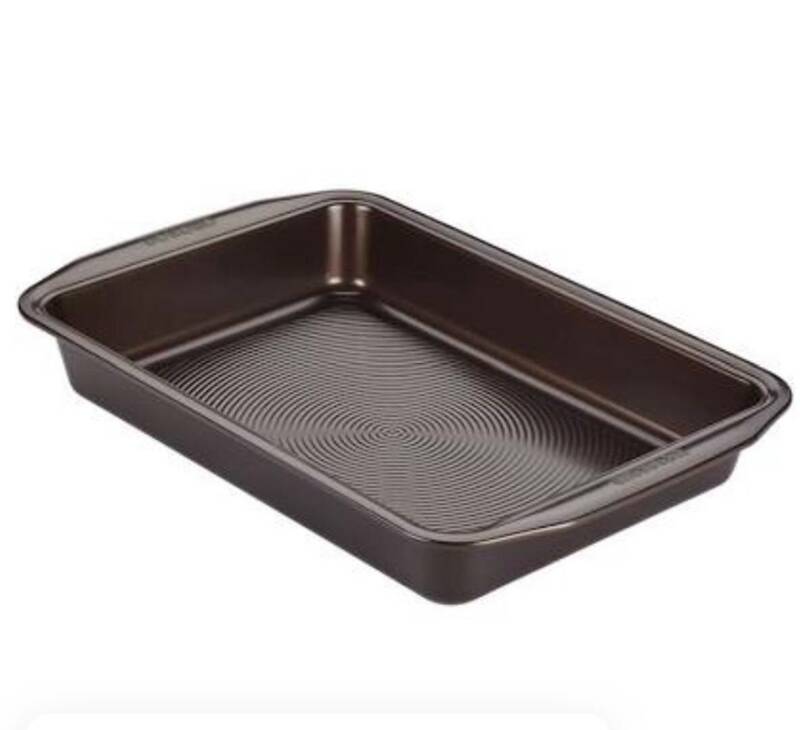 A metal pan you bake brownies ( the food snack ) in. No brownies in Fisherman’s Bay? What's the story on the one in your pictures? Did you borrow it or something or is it from another game you own? I have two of these and one is missing the coin box. Just need to find one for my 2nd machine. I literally have 20 -30 spares kicking around in my garage. If you need one I can set you up. Let me check your dimensions and I will get back. If the dimensions are close, I’ll take it. If you could shoot me back the dimensions of what you have we can go from there. We used to call those 'wedgies'. I got one from a evel Knievel, not exact but close. Wait, you have two Skill-Rolls? Can I have one? I’ve actually have two and a project. I’ll let the project go here in a little bit. Unfortunately his coin box was a bit too wide. This is the hole opening I’m working with. It’s a enclosed cubby, so the measurements need to be pretty spot on. I previously mentioned that I made one out of wood. 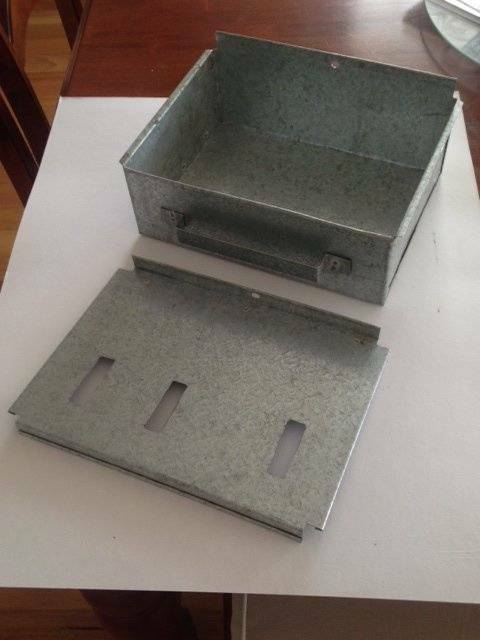 IIRC, an em coin box fits width wise, but its too deep. 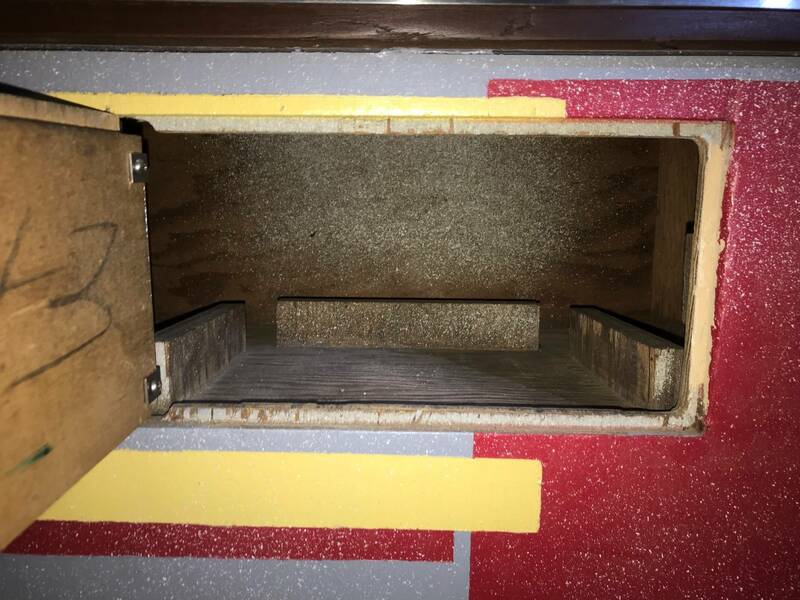 If you cleave off the back block inside the machine you can probably use an em coin box, or just let it ride with back of the coin box on top of the wood. I'll wait it out a bit longer before I start chopping off pieces from the cabinet. Is that how I would look it up on the web? Stand down, I too have a ton of boxes. Will go measure some. Yes.Heating and Cooling company that fabricates tin ductwork. I'll wait until I hear back from Drain. Thanks for checking for me brother. As I suggested earlier why not make one! 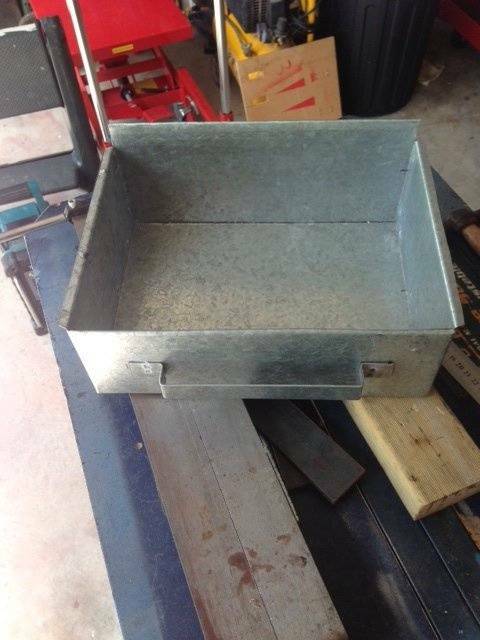 This can be achieved with basic tools including a small bender (shown in 3rd pic) which can be picked up on ebay or I assume Harbor Freight. 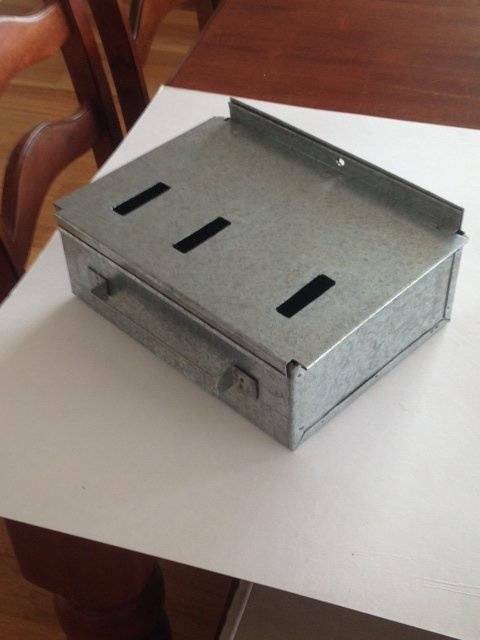 This is a GTB coin box I fabricated a couple of years back starting with a cardboard mock-up. Yours is simpler without a lid. If I can’t find one through drain could you possibly make me one? Sorry to alarm you Shawn. 15 spare boxes, none your size, or close enough to work. Sorry. Shipping from Australia would be prohibitive. 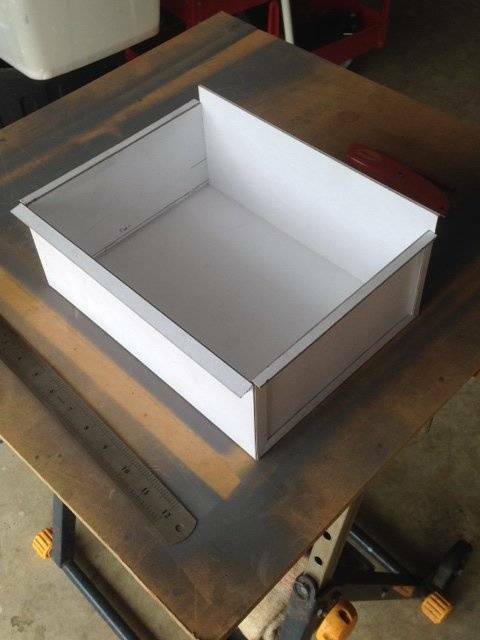 If you are not comfortable making yourself your best bet is to get a local fabrication shop to do the job but I would suggest you still do the mock up as the template ensuring 'it fits'. Thanks to all who helped me out with this. Ok, now that he has one, I need one. 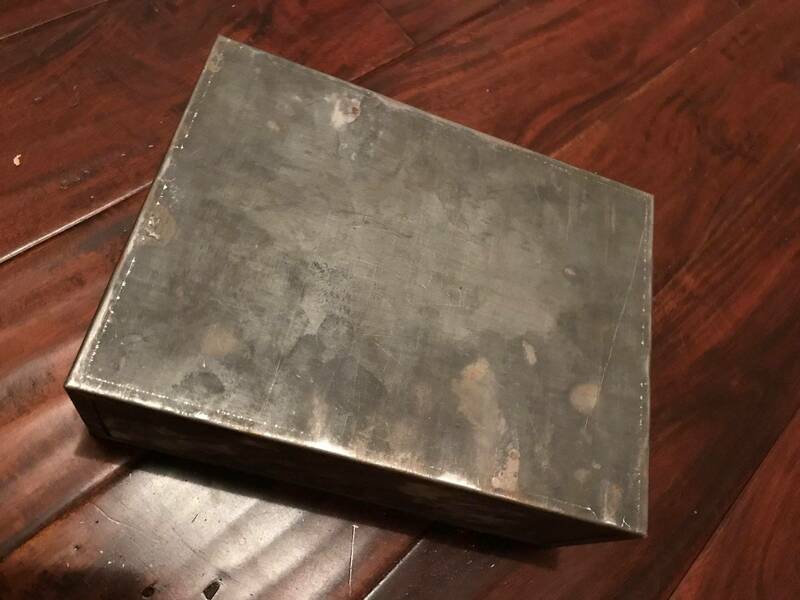 I work for an HVAC company, and I can confirm, most HVAC shops should be able to make one out of tin for you. For the homeowners in the thread: HVAC = Heating, Ventilation and Air Condition. 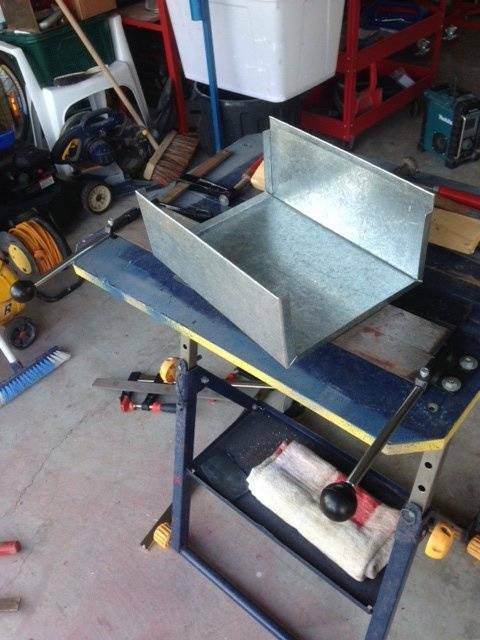 Most shops have a tin-knocker, which is what you call someone who fabricated duct work. 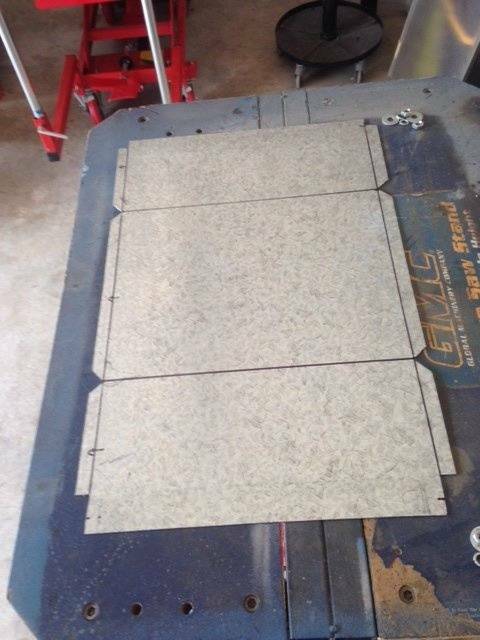 For those guys, making anything out of sheet metal is a walk in the park.